Me SP & the Bean. : what's for dinner? Shaun is many things - including a very helpful husband - but a cook he is not. Which isn't that big of a deal because I quite enjoy cooking (unless I have all-day morning sickness, and/or it's after a 10 hour work day). My only daily challenge is "how much vegetables I can cram into a meal before Shaun starts complaining". He's a carnivore through and through (and me, who is a border line vegetarian), so our dinners often end up being one platers that are much easier for me to "sneak" veggies into. Today's dinner was on the simpler side. Thanks to a migraine which I can't take medication for. 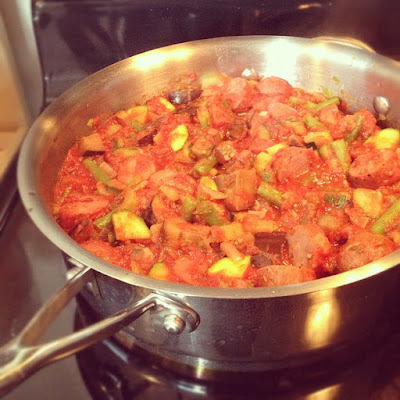 I made a quick tomato sauce with turkey/chicken sausage and lots of veggies (zucchini, eggplant, celery, & green beans). 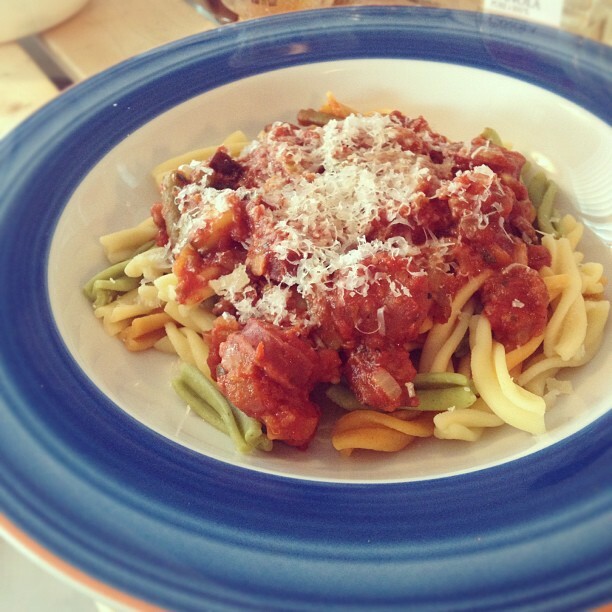 Usually I stick to whole wheat, but today's was fresh pasta from St. Lawrence Market. Hoping tomorrow is a better day. Happy Friday! Thanks Bola! I love the Italian place at St. Lawrence Market. Their tri-coloured sauce is really good too. I need to make a trip down there again soon.